The Sacrament of Holy Baptism is a very special event at First Church. During baptism we recognize that one is a Child of God, and a member of the Body of Christ. 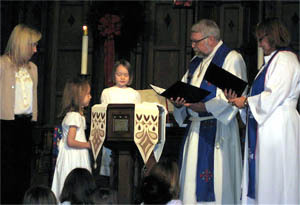 Normally baptisms take place during worship when the congregation can witness the sacrament and pledge their support. However, if you cannot schedule the baptism at the church (due to illness or other reasons) we are glad to make other arrangements. Baptism may be arranged for anyone, at any age. 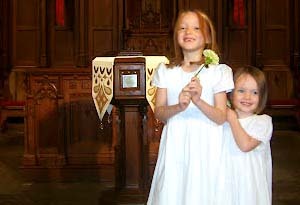 For infant and child baptisms, members of the congregation are encouraged to write personal notes to the child, which he or she will receive at Confirmation. It is a beautiful way to mark the beginning of the child's special place in the congregation. At the end of the ceremony, the pastor walks with, or car ries, newly baptized members down the length of the 100 foot center aisle - to welcome them into the heart of the church. To schedule a baptism, contact us in advance by emailing home@first-church.org or calling 614.228.1741.